Beat flour, milk, eggs, sugar, vanilla, and salt until smooth. (If mixture seems a little too thick, add 1 tablespoon milk.) Preheat oil in Presto® electric deep fryer. If using an adjustable thermostat deep fryer, set at 375°. Heat rosette iron in oil for about 10 seconds. Remove from oil, drain, and dip hot iron into batter. (Do not let mixture come over top of iron.) Return to oil and fry until golden. Remove from oil and drain on paper towels. Repeat until batter is gone. 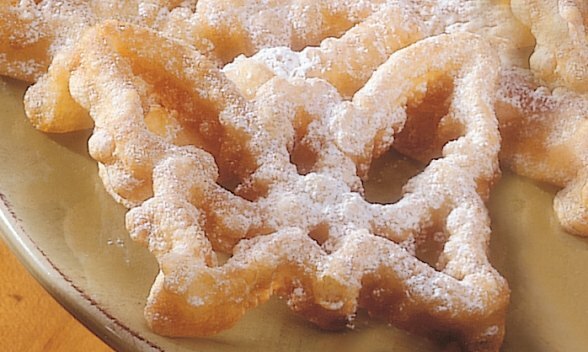 Dust rosettes with powdered sugar, granulated sugar, or cinnamon/sugar mixture** (see below). When cool, store in airtight container. To make cinnamon/sugar mixture, combine 1 teaspoon cinnamon for each 1/2 cup granulated sugar. **Note: To make cinnamon/sugar mixture, combine 1 teaspoon cinnamon for each 1/2 cup granulated sugar.